The Force Will Be With You, Whynot? You must feel the Force inside you as the Slurm courses through your veins. No, that’s not the radioactivity, although there is that, too. That’s the Force. And it’s just waiting for you to use it to pull your ship out of the rest of that Slurm that happens to be dumped in that swamp. In fact, I’m pretty sure the whole swamp is actually made out of Slurm. Can we get a fact check on that? 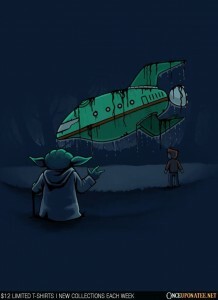 Do those worm things come from Dagobah? I’ll get back to you on that. What is for sure is that there’s Slurm in this area of the swamp and your ship is covered in it. So good luck getting the ship started after I pull it out with the Force. Oh, you wanted to be a Jedi? HA! No. You’re just a delivery boy. So strap this shirt around your torso to commemorate the moment, ’cause I’m the first and last Jedi you’ll ever see.